Visit and Like our Facebook Page to enter. Mobile users, click here. Enter Now using the contest app at the top of our timeline with your “before” picture, along with a caption of why you want/need a new look. Tell your friends and family to vote! They can vote once a day per Facebook user, so come back every day! The two contestants with the most votes after September 8th will each win a $100 E-Gift Card for ChefUniforms.com. Winners will be announced September 9th on our Facebook Page. It’s that simple, so get started today! Good Luck! Contestants must be 18 years or older and residents of the United States, not including Puerto Rico and other US Territories. That’s right. We have a winner! Congratulations to Claudette Thurmond from Claudette’s Creations, for winning the ChefUniforms.com contest for Cash for the Holidays! Claudette is now the proud owner of $500 cash, just in time for the holidays, courtesy of ChefUniforms.com! We will soon be asking this lucky winner a few questions about herself and the tactics she used to win. Her answers will be posted shortly, so be sure to keep an eye out for the next post! We would like to express our sincere thanks to all who participated in this contest. Unfortunately, we couldn’t send all 55 of our contestants a check, but don’t worry… there will be more chances to win fabulous prizes in the future! Don’t forget – contestants, family, friends, and loyal readers – that all this fun was brought to you by ChefUniforms.com! Today is your last chance to vote for a contest winner, so head over to www.ChefUniforms.com/Contest and choose your favorite! In case you’ve forgotten, the winner of this contest will receive $500 Cash, just in time for their holiday shopping! These contestants need your help to win the money, so be sure to take a moment today to choose the one you think deserves the grand prize the most. Remember, only one vote per valid email address will be counted! We would like to take this opportunity to thank our contestants and all who voted for taking part in this contest. Stay tuned for more fun to come from ChefUniforms.com! The time has come! If you’re a contestant, it’s time to get out there and spread the word to all of your family, friends, coworkers and casual acquaintances to vote for you to win! If you are not a contestant, be sure to vote anyway, because they need your help to win. It is your choice who you think deserves to win a check for $500! So go to our voting page, choose your favorite culinary professional or culinary student, and get your vote on! These individuals have worked so hard in order to serve you the food you love, and are now awaiting their adoring public’s votes. Every vote counts, so if you’re one of the contestants, don’t forget to vote for yourself! And remember: only one vote per person is allowed! All contestants have an equal chance of winning this prize, and even if you don’t, the consolation prize isn’t too shabby… for any contestants who reach 1,000 votes or higher before 11/28/2011, ChefUniforms.com will give you a $50 Gift Card! Now get out there, vote and spread the word! That’s right! Today is your last day to register for the chance to win cash for the holidays! In other words, you have just a few hours until the contest registration closes, and you’ll have missed a great opportunity to win an awesome prize. In case you didn’t hear about it yet, ChefUniforms.com will be giving away a check for $500! All you have to do is go to www.chefuniforms.com/contest and fill out our online entry form, send us a photo, and then e-sign our Rules and Regulations form. That’s it! You’ll then receive the URL to your personal voting page, which you should give out to all of your friends, family, coworkers, and even strangers off the street if you’re feeling up to it! Then, tomorrow (10/25), the voting will begin. Tell all of the people who have your URL to go there and vote for you. It’s that simple! We’re talking about Free Money! Just think of all of the great holiday gifts you can buy your family (or yourself) with all of that money! Take a chance and enter our contest. Who knows, you just might win! But wait, there’s more! Even if you are not the grand prize winner, there’s still a chance to win something. At the end of the competition, the contestants who managed to get over 1,000 votes will win a $50 ChefUniforms.com Gift Card! For more information about the contest and for complete rules and regulations, please visit www.chefuniforms.com/contest. Win Some Extra Cash for the Holidays from ChefUniforms.com! Go to www.ChefUniforms.com/Contest and fill in the online entry form. Tell us why you deserve to win the money. … That’s it! That’s all you need to do. From October 25th to November 28th, have all of your friends and family members to go to your personal voting page on our site to cast their vote for you! And don’t forget to vote for yourself! Only one vote will be permitted per person. The contestant with the most votes as of November 28th will be the winner! Grand Prize will be a check for $500. Any participants (excluding the grand prize winner, of course) who are able to get over 1,000 votes before the end of the voting period will receive a $50 ChefUniforms.com Gift Card! The winners will be announced on November 29th. Let the contest begin! For more information about the contest and for complete rules and regulations, please visit http://www.ChefUniforms.com/Contest. 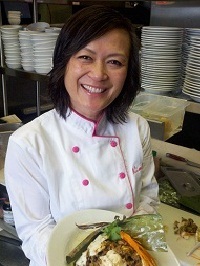 Kimber is one of two winners of our ChefUniforms.com contest. Below you can find her contest entry essay, the recipe she submitted, and our interview Q&A. Bon Appétit! Hello! I’m very happy to say I will be celebrating my 13th year anniversary of my restaurant, Magenta, this June 18. Without any former culinary education, or much in my pocket to start with, I have created my high end fusion restaurant in a very small town of Corvallis, Oregon. Food is my passion and is an art to me, and is due to eating very well at home. I had to do what I had to do to build my little dream. Never have built a wall nor done any dry wall stuff before, I have figured a way to make my little tiny restaurant in a mall across from OSU campus looked “as if they were sitting in Paris”, as many of our customers have said. Nine years later, I was fortunate enough to have found a building in downtown of Corvallis of my very own. It is now quite the “amazing building”, and most from my own sweat and time. And, this last August, I just made a purchase of another building downtown. I am creative and very original. I don’t like to copy other’s recipes, as I think it is more fun to create my own and i can have another excuse to pat myself on the back :). Since Magenta restaurant opened, I have made it to several front pages of the newspapers, sunset magazine, opened several more other restaurants in town. I am known in town as the sauce gal! I am all about sauce! Flavor is a huge thing for me. It can look pretty, but if it doesn’t taste flavorful, it isn’t going to do it for me. I also hold my very own courses on cooking, “Feel the Flavors”. This teaches people to use all of their senses while cooking, and using the last is their tongue, and only if they have to. Now, I ask myself this question too, “Why do I deserve to go to the NRA?” My whole heart and soul is in the restaurant industry, I have so much more to tell as I am very proud of all the things I have created and done in the past 13 years. You will have a person you can share and be proud of going to the NRA! 1 tbsp of chopped kaffir lime leaves, or lemongrass if it’s easier to find. 1/4 tsp white pepper or black pepper if you don’t have white. Cook until pork is greyish in color (doesn’t sound pretty but it’s the color you are looking for. 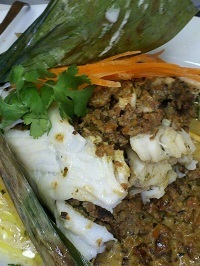 Now, butterfly your big chunk of Chilean Sea Bass, if you can’t find this bass, any other fatty and flaky fish is fine. When using a thin fish, you will not have to butterfly. Sprinkle fish with 1 tsp of fish sauce, lightly rub into fish. Pour pork mixture over one end of the bass, then roll over to the end to form a log. Wrap banana leaves all over the bass log and cover as much as you can, tying using strips of the leaves. Buy a piece of fresh fish so you can have it a little rare! 1. How does it feel to win an all-expense paid trip to the 2011 NRA Show? Very thankful to all my great friends and big fans from of Corvallis and the surrounding cities. 2. What do you plan on getting out of your trip to the NRA? 3. How did you go about getting all of those votes? What did you do that helped the most (Facebook, Emails, etc)? Email addresses from customers on file, requesting customers to leave their email addresses in our log book for this competition, Yes Facebook & texting all of my friends with a smartphone. 4. Why did you want to become a chef? 5. What fabric and style of uniform do you enjoy wearing most? Women fit most definitely! And cotton, with some blends OK. We’ve been told, many times, we are very stylish in the kitchen! Thanks to you guys! 6. Do you enjoy dining out in your free time? Any moment I can as it is very much my true passion! I don’t mind spending hundreds of dollars when it comes to eating well…and I only drink well! 7. Do you ever get menu ideas from your competitors? Of course! I have to see what others are doing in the very near areas so I know NOT to do the same thing as they! And if I find that once my style or recipe is being used by someone else around, I will immediately change it! I get ideas on using products, I will be the person creating the rest! 8. Do you see any changes in food trends? No, for at least the last 13 years! It has been modern with a touch of history for this long. However, the “organic” and “local” thing… is now more prominent! And of course mending style for allergies that didn’t surface until this decade! 9. Is there any one thing you would have done differently in starting your culinary career? Yes, silly thing such as purchasing a business and basically demolished it, using it only for its space! Yet, I learned a lot too from having no money left, I had to do most things myself, such as building walls! Cooking related, I enjoyed every moment and wouldn’t know of a better way! 10. What advice would you give to someone who wants to go into the culinary field? Organization, know your tools, be the creator, feel from your very own senses. Get ideas yet Do Not copy others! Oh, you really can’t be in this field unless you are speedy! Congratulations again, Kimber, and remember to come see us at the show at Booth #1904! 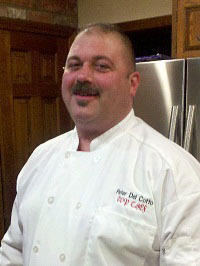 Peter is the first of two winners of our ChefUniforms.com contest. Below you can find his contest entry essay, the recipe he submitted, and our interview Q&A. Bon Appétit! I deserve to go to the NRA show because I want to improve my skills and serve my community by opening a restaurant in my home town. The NRA show will not only broaden my knowledge base but make me a better person, chef and family man. I have traveled all over the world serving our country and want to give back to those who supported me throughout my life such as the local community, parents, family, friends, fellow colleagues, and certainly not least, my professors. I am currently studying for my degree in Hospitality Management and have a 4.0 GPA. Unfortunately, I am also a victim of corporate downsizing and unemployed. Due to the lifestyle change, the decision was made to totally retrain into a different industry and go into business for myself and my family. The trip to the NRA show allows me to get immersed into the industry and get a restaurant and culinary world view, Not to mention meet the great people of the industry! Please consider my essay for the culinary student award. My family and I would be forever grateful to Chef Uniforms.com and the NRA. As an added bonus, I am submitting a picture of me in one of your handsome embroidered chefs coats while I’m in action in our kitchen at home. Add olive oil and once heated, add onions and salt, sweat onions for 8 minutes stirring occasionally then add garlic, dried spices and sweat for another two minutes. When finished, lower heat to med low and add tomato paste, stir frequently until spices and onions are incorporated into the tomato paste. Cook for 2 minutes, stirring occasionally. 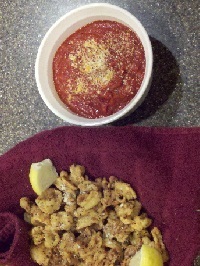 Then add tomato sauce and stir to incorporate ingredients. Bring sauce to a simmer slowly, stir occasionally. Add cheese and cook an additional 5 minutes. Well, I have to admit, pretty darn good! When I received the notification that I won, I was elated beyond belief, I couldn’t wait to post the good news to my family and friends. In addition, to have an all-expense paid trip is a dream of a lifetime that became a reality. After graduating, I am opening my own restaurant. The NRA show has every exhibitor in the industry available to meet with and consult. I am sure I will walk out of the NRA show a well-educated man on the restaurant biz. In addition, I hope to network with other leaders in the industry and utilize their experiences to mold my restaurant. 3. How did you go about getting all of those votes? What did you do that helped the most (Facebook, Emails, etc.)? As part of my degree program, students must take a sales and marketing course. Last semester, we covered the impacts of social media and their use in the hospitality industry. Come to find out, the impacts were huge and through their use, saved many restaurants during the economic downturn. When the contest started, I fired up my laptop and started an event on my Facebook page. I individually messaged the event to my 290 friends and asked them to forward the event to their friends. In addition, I contacted Trocaire College’s web and social media director, Jackie Bryant and asked if she could get the college involved and support me in the contest. Other items that helped were writing a press release and sending it out to the local media and an occasional ‘tweet’ on Twitter. Having traveled all over the world while serving in the military, I have experienced the tastes and smell of many cultures’ foods. Food tells a certain story about the people and their environment. I want to become a chef because I want to share my experiences in other cuisines besides classical American by highlighting popular dishes of each respective culture. Yes, we dine out at least two times a week. It can be anything from the local pizza joint to casual fine dining at a local independently owned restaurant. 7. Do you see any changes in food trends? Yes, I have been doing a lot of research on upcoming food trends and utilizing the NRA’s website to gather my information. Interestingly, there are many trends that are in high demand such as, tapas, Asian, food trucks, affordable entrees with reduced portion sizes and reduced priced apps during the week. 8. What are your future plans, once you become a full-fledged professional Chef? After working the line in the restaurant, I would like to eventually take the Executive chef’s position with the ability later on to manage the business entirely. If business is good, I may just open another restaurant in another part of the U.S.
Start it early in life! The restaurant business is demanding and there are long hours in the kitchen. By starting earlier, not only do you gain the fundamental skills to base your experiences on but also the ability to cope well under pressure and fatigue. 10. What advice would you give to someone who wants to go into culinary school? Do I like people? Am I independent or do I work well with others? Do I like to work long hours? Weekends? Holidays? Do I take directions well and have the ability to produce what is asked of me? Am I doing this for the money or the love of the career? If I own my restaurant, am I willing to work without getting a paycheck every week? Can I accept constructive criticism or feedback from fellow co-workers, managers, and customers? If you answered positively to the questions, you are ready to investigate and follow your culinary dream. If not, look into other aspects of the industry such as, lodging, cruise lines, and air transportation. There is a variety of careers within the hospitality industry to choose from. Congratulations again, Peter, and remember to come see us at the show at Booth #1904! That’s right. We have a winner – actually, make that winners! Congratulations to Kimber Hoang from Magenta Restaurant and to Peter S. Del Cotto from Trocaire College, for winning the ChefUniforms.com contest for an all-expense paid trip to the 2011 National Restaurant Show in Chicago, IL! We were able to catch these two lucky winners and ask them a few questions about themselves and how they won. Their answers will be posted shortly, so be sure to keep an eye out for the next two posts. And their very own featured article on the Chef Vibes Blog. We would like to express our sincere thanks to all who participated in this contest. Unfortunately, we couldn’t send all 31 of our contestants to the show, but don’t worry… there will be more chances to win fabulous prizes! As for the NRA Show, we are hoping to make this contest an annual event, so be sure to check back for next year’s contest! And if you do make it out to the show this year, be sure to stop by our booth (#1904) and say hi! ChefUniforms.com Contest…Let The Voting Begin! As you probably already know (since this is our third blog post on this topic), today is the first day of voting for the ChefUniforms.com Contest contestants! What you may not already know is that the contestants need your help to win. 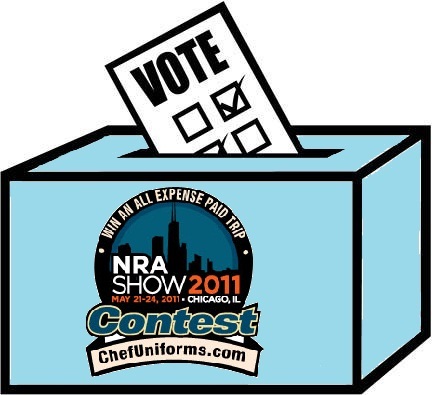 It is your choice who you think deserves to win an all-expense paid trip to the 2011 NRA Show in Chicago, Illinois! So go to our voting page, choose your favorite culinary professional or culinary student, and get your vote on! These individuals have worked their fingers to the bone (probably a chicken bone), in order to become great culinary professionals. They work (or study, for those who are students) their you-know-whats off in order to prepare the best meals for their customers (or professors), and are now awaiting their adoring public’s votes. Every vote counts, so if you’re one of the contestants, don’t forget to vote for yourself! And remember: only one vote per person is allowed!